ResearchTies is happy to announce that users can now link a document to more than one result. 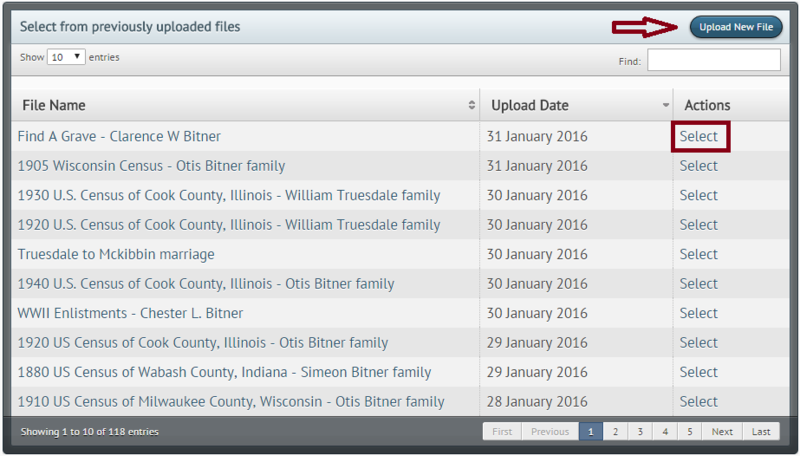 When recording a result, click on “Add file,” and a list of previously uploaded documents will open. The list is sorted in reverse order so the most recent upload is at the top. 1. To add a new file, click on “Upload New File” in the upper right corner. You will be shown the usual template to name and select the file to upload. 3. To link a document that was uploaded a long time ago, you can scroll through the list, but it might be easier to enter a keyword from your document title in the “Find” box (located in the upper right corner of the menu). The list will narrow to documents with that keyword in the name. When you find the correct image, click “Select.” It’s that easy! We hope you enjoy this new feature, and as always, feel free to ask questions or send feedback. Happy researching! ← RootsTech 2016 Begins This Week!